Aspirin, the most widely consumed drug in the world, is a chemical substance called acetylsalicylic acid. 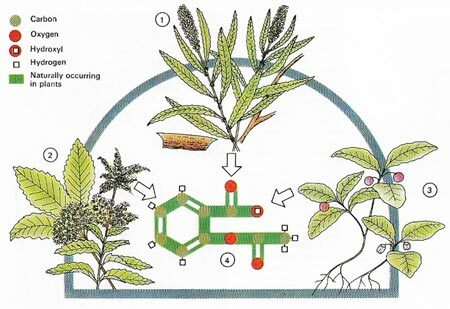 Plants such as willow (Salix fragilis) (1), meadow sweet (Filipendula ulmeria) (2), and shallon (Gaultheria shallon) (3) contain the related substance salicin. The presence of this pain-reliever was the basis of many old remedies. As salicin is too bitter to be taken internally (the same is true of salicylic acid, the first chemical derivative of salicin), it was not until it was made into its acetyl derivative in 1899 that aspirin (4) emerged. Aspirin reduces inflammation (C) by limiting production of the chemicals prostaglandins and kinins which are released in an inflammatory cascade" (B) when the body's defenses tackle an antigen or foreign body. Histamine is not affected..
Aspirin, also known as acetylsalicylic acid (see salicylic acid), is an effective analgesic, which also reduces fever and inflammation and also affects blood platelets. It is useful in headache, minor feverish illness, menstruation pain, rheumatic fever, inflammatory arthritis, and may also be used to prevent thrombosis. Aspirin may cause gastrointestinal irritation and hemorrhage, and should be avoided in case of ulcer. Aspirin reduces fever (A) by regulating the brain's temperature control center (1) and by increasing sweating (2). It reduces pain by cutting reverbatory impulses at the thalamus (3) and inflammation at joints (4, 5), but it can cause bleeding (6) and skin rashes (7) with some people. Research in recent years has pointed to the effectiveness of taking aspirin regularly in middle and old age in helping prevent heart attacks. According to a paper published in the journal Heart in 2008, based on an analysis of almost 12,000 patients carried out at Nottingham and Sheffield universities analysis, men from the age of 48 and women from 57 would benefit from the drug. In the case of people over the age of 75, the decision whether or not to take aspirin must be made on an individual basis, because they are more likely to suffer bleeding complications. The U.S. Food and Drug Administration (FDA) has issued the following warning about aspirin use during pregnancy: "It is especially important not to use aspirin during the last three months of pregnancy, unless specifically directed to do so by a physician because it may cause problems in the unborn child or complications during delivery." Aspirin is transferred to breast milk and it is estimated that a nursing baby receives about 4–8% of the mother's dose (World Health Organization report, 1988). Continued exposure to small doses of aspirin may be harmful to babies because aspirin tends to build up in their bodies. In some countries, nursing women are advised against aspirin use because of the possible development of Reye's Syndrome in their babies. Reye's Syndrome is a rare condition that affects the brain and liver and is most often observed in children given aspirin during a viral illness. Because sufficient information is not available to accurately determine the extent of aspirin accumulation in babies and the resulting health outcomes, the World Health Organization Working Group on Human Lactation considers aspirin intake by nursing mothers as unsafe. The American Academy of Pediatrics Committee on Drugs (AAP 2001) listed aspirin as a drug that has been "associated with significant effects on some nursing infants and should be given to nursing mothers with caution." The report suggested that safer drugs such as acetaminophen should be used for pain relief during pregnancy.